Thank you for planning a visit to the Brown University Department of Mathematics. Here is some important information that may be useful to you. Other than driving, there are several ways to come to campus. 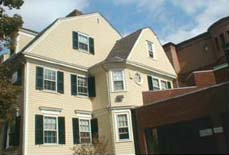 Brown is within walking distance to several of Providence's most popular hotels. We also offer Visitor Scholar Housing for long-term visits. Visitors may find parking in Lot 68 Upper, also called the Power Street Parking Garage, located at 111 Power Street. The garage entrance is located at the intersection of Power and Thayer Streets (View Map). The garage has two gate arms which are left open. Please enter in the right lane and exit via the left lane. The Lot 68 Upper garage contains two pay stations, which are located at the front and rear of the garage. Please locate an empty parking space, purchase your visitor parking permit via a pay station and place your receipt permit on your vehicle dashboard. The pay stations accept credit cards and U.S. bills. However, the pay stations do not supply change so please use the exact amount of bills. Please allow plenty of time for parking, as the visitor lot is a few blocks from the Campus Center. Brown maintains visitor spaces that meet ADA standards for accessibility in Lot 65, which is located on the south side of Benevolent Street between Thayer and Brook streets. Any valid state ADA placard may be used in any ADA space in the lot to park for FREE. Visitors may find metered parking on the streets in and around campus. These meters take both cash and credit cards and costs 25 cents for every 12 minutes. Metered spaces allow for a maximum 2-hour parking. Please pay close attention to on-street signs marked for Brown Permit Parking. These spaces require a Brown employee daytime parking permit between 8am-12pm. If the department is reimbursing your travel expenses, please fill out the Supplier and Individual Payee Registration Form and send all original, itemized receipts to the department administrator. Without this, Brown will not be able to process your reimbursement request. When making your travel arrangements please be aware that Brown can only reimburse payment for coach seats for airfare and train tickets. Please click here if you are a foreign national requesting reimbursement.